How can this be, this is the first time Martin and Murphy star together! Lame producer Bobby Bowfinger (Steve Martin) has a script that’s brimming with possibilities. The catch? To get seed money to produce the film, it must feature Hollywood’s leading box-office star, Kit Ramsey (Eddie Murphy). Aided and abetted by a cast and crew of misfits, Martin makes one last stab at overnight success. 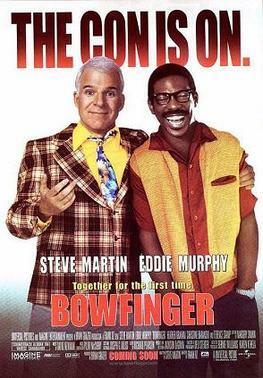 Bowfinger is what it looks like is a parody of Hollywood in general. Frank Oz directs this who is known for directing films such as What About Bob?, and The Stepford Wives creates another witty film with actually some pretty intelligent satire. The funniest thing about the film is how this movie gets made. It is filmed by just having Eddie Murphy’s reaction to everything, and you think that will go well for a scene or two, but eventually it turns into a whole movie. His reaction to everything is priceless and as outlandish as the movie gets when they approach him, the more hilarious the reactions get, and they actually start fitting in with the movie. Great premise with a great deliverance. The screenplay if a little drawn out is actually pretty wise. The script is very satirical but also many of the lines from Martin’s character of how he’s trying to con everyone to do this movie is really smart and actually reminds me of stuff that I would say. Much of the social commentary on Hollywood may seem a little too insider-y for some of the natural audience but if you understand what the joke is then it’s hilarious. Martin and Murphy are really good in this film. Steve Martin does a great job at trying to be a somebody and he starts out as a bad guy but then you soon realize that he is just a person trying very hard to get his film out there no matter how crappy it actually is, sort of like an Ed Wood. Murphy in this film shows that he is still hilarious and can still act as a very mean but at the same time funny person and he has a dual role but this one is different because the other character he is playing is actually a better person and you like him more. The problem I had with this film was that there just wasn’t enough. My expectations of the film was that this was going to be the funniest film I’ve ever seen but instead it was at times mildly funny. I expected so much more from these two comic geniuses and I know Frank Oz can be funny so why wasn’t my stomach aching by the end of the movie? I don’t know it just wasn’t as funny as I expected. Consensus: Ozs’ satirical take on Hollywood is smart. And with two leads like Eddie Murphy and Steve Martin there are sure to be laughs just not enough in my book.